When did you realize love is a lie? When the girl you liked wouldn’t sit next to you on the bus to school? When Jack died in Titantic? When the first guy you kissed never called you back? Maybe it was Sunday, August 28, 2016, at roughly 11:45 p.m. Maybe you had just given an award to the girl you’ve been in love with since you were 22. Maybe you went in for a kiss. Maybe your name was Aubrey Drake Graham, and she swerved you hard and said … What did she say? Now, as Sofia Coppola taught us with an analogous whisper in Lost in Translation, the human heart is a mystery. Words, on the other hand, are real. They have meaning. So do actions. We can’t hear Rihanna’s voice, but we can see her lips. Her chin extends at first, then the tongue pulls back: “That,” we might assume. Then, another word, which seems to begin with the smiley shape of a “w” sound. “Was?” We have a subject and an object, folks! Now, the participle, which seems to begin with a fricative, though the camera cuts away as Rihanna completes the word. “Funny” seems to fit. Drake was trying to be funny. Drake is always trying to be funny around Rihanna. That’s why he took her to an aquarium. Sometimes, when they go out for pasta (her favorite), he sticks his fork into his meatballs and makes them do the Chaplin dance. “That was funny,” Rihanna says, even though it wasn’t. But, in the candlelight, next to the half-finished Chianti, it is funny, because Rihanna says so. If, say, you were receiving a lifetime achievement (what we assume “vanguard” means, but who knows) award for your work in the music industry — and if a guy you’d hooked up with a few times happened to be presenting said award, wouldn’t you want things to be casual? And by “casual,” we mean “devoid of professions of love.” There’s space for a second syllable in the middle of the clip, especially if Rihanna goes soft on the “n’t.” “That wasn’t funny,” Rihanna says as she shakes her head. But I love you, Drake thinks. Why do men do this? Rihanna thinks. What makes them think they always get to force our hand? Drake is coming over again to lead her off the stage. The cameras flash — a million lights, like being tried in the court of the fireflies. I should call Sia, Rihanna thinks. That could be a good song. 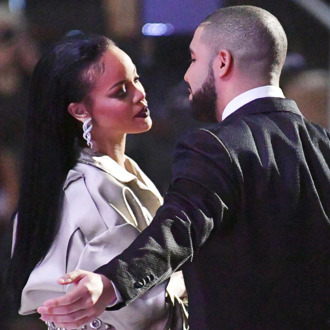 What Did Rihanna Whisper to Drake at the VMAs?